Speaking out is not that hard. 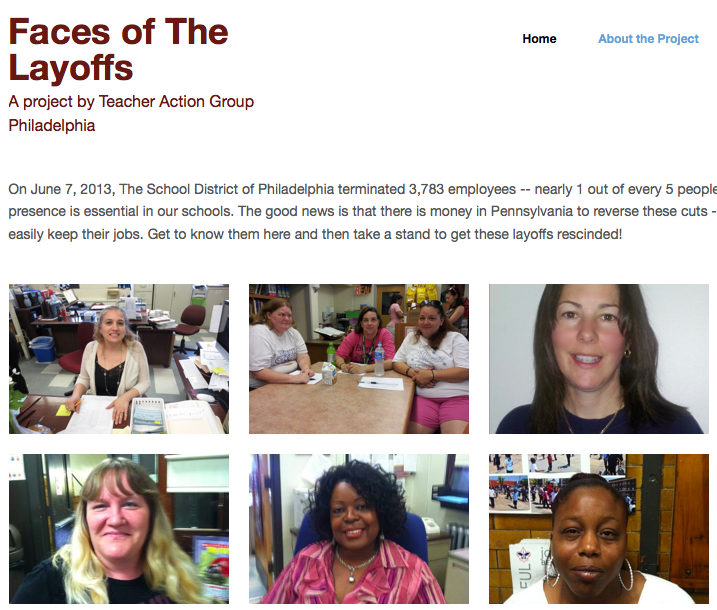 Almost two months ago now, I set up the Faces of The Layoffs website. It was a really simple impulse — I wanted to do something for a friend and former colleague who had gotten a layoff notice in the mail that day. What if I could post her story on Facebook, with a photo to put a face on it? I thought. Wait. What if we could get everybody to do that? The most rewarding part of this project was interacting with people who sent in submissions for the site. The vast majority of entries were sent in not by the people who got the layoff notices, but by their colleagues and family members who took the time to honor the skill and dedication of those close to them. Many of them wrote and said, “thank you for giving me something to do about this.” Many of them also wrote, “what can I do now?” The basic organizing principles worked beautifully: take your anger, find some hope, and make a plan. As you may know, the school district budget is still a mess. I don’t think for a second that the Faces project will solve that. But we managed to influence public opinion for the better — and it was not that hard (see paragraph 3.) I had a good idea, and a few great communities to support me. If you’re in Philadelphia and you haven’t spoken up yet, collect your anger and come join us now. This entry was posted in Big Picture on July 26, 2013 by lpahomov.